SOUTHINGTON - After Michael Zapatka came up lame following a collision with Southington goaltender Garrett Brown, the sophomore midfielder for the Newington boys lacrosse team shook off the pain and stayed in the game. He didn’t want to come out when the Indians were battling to erase 12 years of losing to the Blue Knights. Plus, the team needed him. But one quarter later, Zapatka was involved in another collision in the attacking zone, and after being examined by the training staff, took his pads off for the day while Newington tried to find other outlets of offense in an eventual losing effort. It’s unclear if Zapatka will miss games due to the injury, but the Indians’ need to fill an already big void in the roster is apparent. 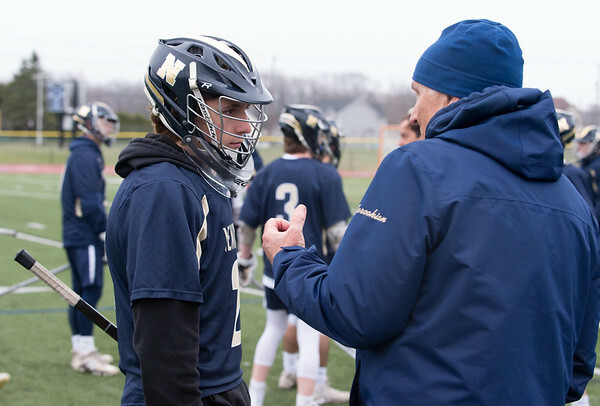 After reaching the qualifying round of the Class L state tournament last year with a 10-7 record, Newington has been tasked to fill the shoes of Connor Brennan, a recently graduated senior who left the program with the most career points in team history. Joining Brennan on the graduation walk last year were Rob Petronio and Matt Barron, a pair of Indians who moved on to play at the collegiate level, leaving Zarookian with the task of replacing a bit of production this season. Still, looking through his roster, Zarookian likes what he sees from his returning core. It’s hard to replace a talent like Brennan, but Newington has done its best to do so over its first four games. The Indians hold a 2-2 record and have recorded double-digit goals in three of their first four games, coming up just short of making it 4-for-4 in Monday’s nine goal effort. What Newington may have lost in experience and talent, they have gained a sense of youthful hunger that has kept the team wanting another state tournament berth this season. On the defensive end, Petronio was a cornerstone for the Indians, helping anchor a group of two seniors, but the now sophomore-heavy defensive group has come along nicely so far for Zarookian, who believes the young core is already playing ahead of its experience level. The improvement has come via baptism by fire, thrusting the underclassmen into game action, which has forced them to adapt and improve. So far, that plan seems to be working. The Indians are still searching to snap its 0-11 streak against Southington since 2007, but the 13-9 loss was the second-closest scoring margin in that span. Strides are being made, and more importantly, lessons are being learned, which the team believes will pay dividends as the schedule and the weather heat up. Posted in Newington Town Crier, Newington on Tuesday, 9 April 2019 18:27. Updated: Tuesday, 9 April 2019 18:30.